I completely understand what they are trying to do over there at Sesame Street. They are trying to entertain the parents while educating the children. And don’t get me wrong I totally appreciate the effort. But to use True Blood and Sons of Anarchy as their inspiration, two of the most mature and violent shows on TV today, seems so odd to me. 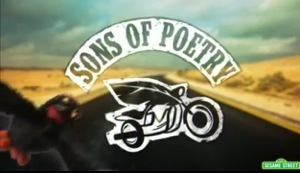 The theme songs & graphics match perfectly. The muppets even look like the characters. 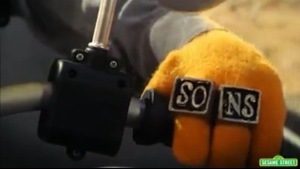 One muppet in the Sons of Poetry is even wearing brass knuckles for God’s sake. Really?!?! So, of course my sick-minded, former marketing brain started to churn and think of all of the other inappropriate shows that my friends over at Sesame Street could mimic next. Please don’t judge me. I’m a stay at home mom and my brain is slightly atrophied so I have to use it in any way that the universe presents itself these days. Oh, and you’re welcome! – what better way to teach children about rhyming and iambic pentameter than to share 4 new york fashionista muppets sharing a sonnet about Manolo Blahniks during muppet fashion week? 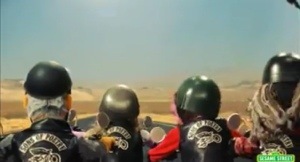 – 2 plastic surgeon muppets would take trucks that want to “change” the way they look and make their dreams come true. An ice cream truck could finally fulfill its life long dream of looking like a shiny red fire truck. A garbage truck can finally look like the cement truck it had always felt like on the inside. – a muppet in his 20’s and his muppet science teacher would go to secret hideouts in the new mexican desert in their muppet RV and use science to bake secret treats that everyone will want….really, really bad. – A blended family full of loud mouthed, self-centered yet oddly rich-as-hell muppets will create contrived and ridiculous situations to teach fractions. If Khloe muppet has 2 stupid conversations with Kim muppet and Kourtney muppet has 1/2 a stupid conversation with Kanye muppet and Bruce muppet just sits there and says nothing, how many stupid muppet conversations happened? – Joffrey the muppet would teach pronouns like himself, whatever and nothing. Khalisi the muppet and her muppet dragons would teach pronouns like everyone, much and everybody. – a group of zombie-hunting vigilante muppets will try to save mankind by solving riddles that reveal the color RED. – this segment will show 4 male muppets going from seedy Vegas bar to seedy Vegas bar wearing really tight shirts (complete with a spiked blonde, overly tanned muppet named Brace) comparing the height of barstools to teach the concept of HIGHER and LOWER. So there you go Sesame Street. Your creative team can thank me later. Can you all think of any other examples? Get creative and please share them….